The MUTS trailer comes in kit form in a large cardboard box on its own pallet. Assembly takes about 2 hours. 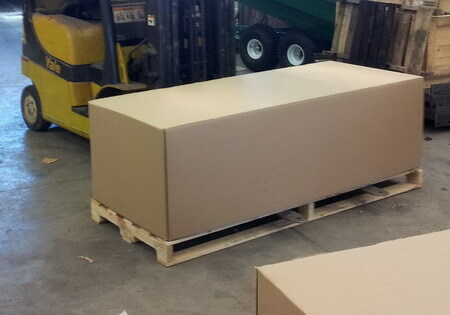 Kit (box & pallet) dimensions are 76″ long x 31″ wide x 28″ high and weighs 510 lbs. The MUTS is 37″ to the top of the box making it a low profile and very stable trailer. The pulley mast can be removed or rotated into the box in seconds to give the entire trailer that low profile. Made from high quality North American materials. The MUTS box is made from 16 gauge galv-annealed automotive steel containing rust inhibitors with a hard, microscopically rough surface to which the powder coat can adhere to extremely well giving it excellent wear and rust resistance characteristics. The bolt together approach allows the trailer to be shipped at lower cost with less potential damage during transport. The assembled trailer can flex without breaking any welds. Damaged components can be removed and repaired or replaced keeping maintenance costs low. Some parts can be removed to accommodate specific user needs. All nuts have nylon inserts so they will not vibrate loose. The polyester rope is user friendly. It will not cut your hands if frayed and will not bind in the drum like wire rope can.